By just having good intentions what will that do? Christians are to be doers of the Word not just hearers. We are not to trust in our minds, but live by the Word of God. In the Bible we see times where good intentions led to bad decisions and sin. Commit to the Lord instead of having one foot in and one foot out. You say well God knows my heart. Well I say that should scare you! You say well I’m saved by faith in Christ alone. The Bible says that faith that doesn’t change your lifestyle is not true faith at all. Having good intentions is procrastinating. You know what to do. You know what Scripture says, but you say I’ll do it later. 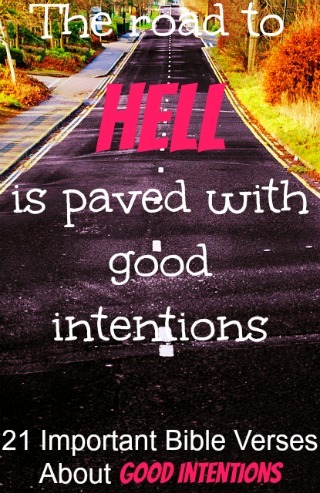 Good intentions are not good at all. They will lead you to hell. When you’re in front of God you can’t say well I was going to obey, but this, this, and that. Excuses lead to hell. God is not fooled. Separate from anything that is bringing you down, repent of your sins, and trust in Christ alone . Good intentions lead to bad decisions. 2. Proverbs 16:2 People may be pure in their own eyes, but the Lord examines their motives. 3. Proverbs 21:2 Every way of a man is right in his own eyes: but the Lord pondereth the hearts. 4. James 4:3 When you ask, you do not receive, because you ask with wrong motives, that you may spend what you get on your pleasures. Good intentions lead to sin and disobeying the law. 5. Proverbs 6:30 Excuses might be found for a thief who steals because he is starving. 6. 1 Samuel 15:22 But Samuel replied: “Does the Lord delight in burnt offerings and sacrifices as much as in obeying the Lord? To obey is better than sacrifice, and to heed is better than the fat of rams. 7. James 4:17 If anyone, then, knows the good they ought to do and doesn’t do it, it is sin for them. 8. Romans 13:1-2 Everyone must submit to the governing authorities, for there is no authority except from God, and those that exist are instituted by God. So then, the one who resists the authority is opposing God’s command, and those who oppose it will bring judgment on themselves. 9. Proverbs 14:12 There is a pathway that seems right to a man, but in the end it’s a road to death. 10. Matthew 7:13 Enter by the narrow gate. For the gate is wide and the way is easy that leads to destruction, and those who enter by it are many. 11. Matthew 7:21-23 Not every one that saith unto me, Lord, Lord, shall enter into the kingdom of heaven; but he that doeth the will of my Father which is in heaven. Many will say to me in that day, Lord, Lord, have we not prophesied in thy name? and in thy name have cast out devils? and in thy name done many wonderful works? And then will I profess unto them, I never knew you: depart from me, ye that work iniquity. 12. 2 Corinthians 5:10 For we must all stand before Christ to be judged. We will each receive whatever we deserve for the good or evil we have done in this earthly body. 13. Galatians 6:7 Do not be deceived: God cannot be mocked. A man reaps what he sows. 14. Hebrews 10:26-27 For if we sin wilfully after that we have received the knowledge of the truth, there remaineth no more sacrifice for sins, But a certain fearful looking for of judgment and fiery indignation, which shall devour the adversaries. 15. James 1:22-23 But be sure you live out the message and do not merely listen to it and so deceive yourselves. For if someone merely listens to the message and does not live it out, he is like someone who gazes at his own face in a mirror. For he gazes at himself and then goes out and immediately forgets what sort of person he was. 16. 1 Timothy 2:4 who desires all people to be saved and to come to the knowledge of the truth. 17. 1 John 3:18 My little children, let us not love in word, neither in tongue; but in deed and in truth. 18. Isaiah 55:8 For my thoughts are not your thoughts, neither are your ways my ways, saith the LORD. 19. James 4:8 Draw near to God, and he will draw near to you. Cleanse your hands, you sinners, and purify your hearts, you double-minded. 20. Isaiah 1:16 Wash and make yourselves clean. Take your evil deeds out of my sight; stop doing wrong. 21. Psalm 34:14 Turn from evil and do good; seek peace and pursue it.